In my last post, I stated that my goal for the 2018 gardening year is to improve my soil. There are lots of obvious ways to do this, and we'll talk about those too, but I also want to talk about some ways I might have been damaging my soil without even realizing it. 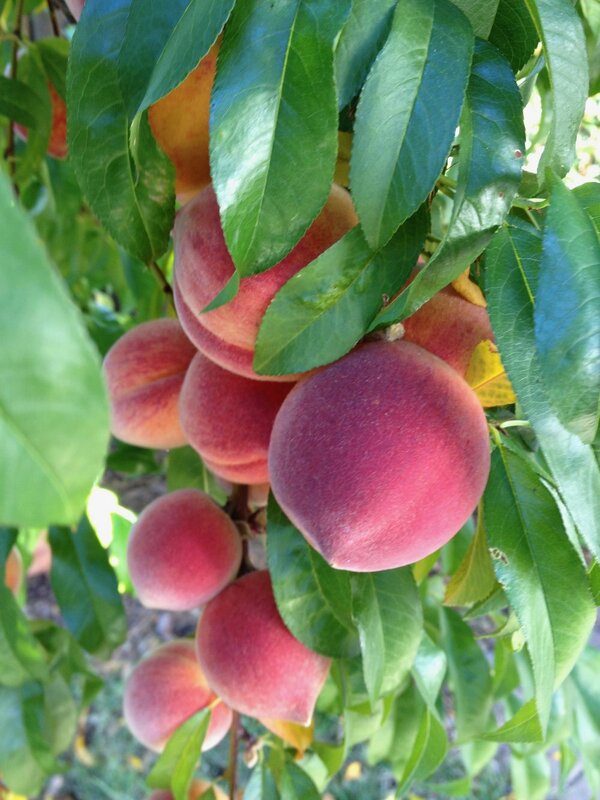 If you have a peach or nectarine tree, you probably have had experience with peach leaf curl, a disease that is caused by a fungus. It puckers and blisters the leaves, and in advanced cases, can limit fruit production. It can also affect the twigs and branches, causing them to die back. Though copper is a 'natural' substance, and it is approved for organic growing, it is not necessarily safe for humans or animals. The package has a 'WARNING' label, which means it has a Moderate Toxicity: "'WARNING' indicates the product is moderately toxic if eaten, absorbed through the skin, inhaled, or it causes moderate eye or skin irritation." One is supposed to wear gloves and a mask when using this product. One is also supposed to douse the entire tree - trunk and all branches, until the product drips off the tree. The package also comes with an environmental warning. When I looked up how copper affects the environment, I found a lot of scientific articles about runoff and fish. I found little that talked about its affect on the microbiology of the soil. But let's just think about it for a moment: If fish are so affected, after it runs off, goes through sewers, and finally into a place where they live, imagine what it's like to be a microorganism living directly beneath the tree. If this stuff can burn our skin on contact, imagine how destructive it must be to earthworms, beneficial nematodes, arthropods, protozoa, or fine threads of mycelium? And just as the microbiology starts to make a comeback after the first attack, we hit them with another? And then another? I've done this every year without a thought for the creatures in the soil. You may ask, why do these creatures matter? Nutrients in the soil are generally not terribly available to the plants, unless they are soluble. And soluble nutrients leach away quite quickly. The way the plants get regular nutrition is that the microorganisms process it in their bodies, then poop it out, making it available right away to the plant. This is a sort of constant fertilizer being made available to the plant in a form it can access. If the soil is dead - with no microbiota - the plant will struggle, and need constant inputs from us. In the same token, I've added sulfur acidifying fertilizer every year to my blueberries. We all know that blueberries prefer an acid soil, right? But what does that sulfur do to the microorganisms living in the soil? More importantly, what does it do to the mycorrhizal fungi that colonize the roots of blueberries? I recently did a report on plants in the Ericaceae family, of which blueberry is a member; plants in this family do not get their nutrition from soil. They get it almost solely from those fungal hyphae, which form attachments to the roots of the plant. Which means the blueberries will succeed only if those attachments form. If I use sulfur on the plants, am I killing the fungal hyphae? Will the plant succeed without my involvement? Well, it has evolved to do so. Why don't I trust that instead? I have thrown out my Liqui-cop. I have thrown out my Espoma organic sulfur acidifying fertilizer. I intend to let the soil increase LIFE, for the animals to recreate all over the place and do what they do best, and what they were designed to do, and that is to feed my plants and ward off diseases, without any help from me. It may take several years for the soil to recover in these areas. The copper that I sprayed also affected the soil underneath and around some of my vegetable beds, which might be why the growth in that particular corner is always lacking, compared to the other beds. This is something I've been scratching my head about for a while now. The copper might be the answer to the lack of vigor in this particular bed, despite repeated applications of compost. Compost is seething with life. And then I come along with the copper sledgehammer and destroy it. So, it will be interesting to see how the peach tree does this summer, and together we can watch to see if things improve. Of course the tree is also in its senescence and probably nearing the end of its life. In which case, I'll just start over - and plant a peach leaf curl-resistant tree. It will also be interesting to see how the blueberries produce. I'm excited to try this experiment, and hope you will join me in eschewing the 'organic' tools that we once relied on.